This album has never been released before. The story behind its creation is unusual. The band New England (I remember loving their debut album) lost their guitarist, leaving them in search of a replacement. Gene Simmons put them in contact with Vincent Cusano who was working with them at the time. So, while still getting songs together for Kiss, Cusano started creating music with the former members of New England. 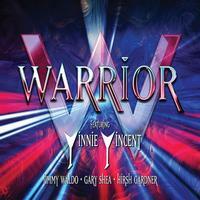 They opted to change the name to "Warrior," but before they actually released anything, Cusano became a full member of Kiss and changed his name to Vinnie Vincent. These recordings show what could have been, and it could have been great. The recording quality isn't perfect (they quit in the middle of the mixing process), but it's nothing that you can't get used to very quickly. In addition to the main recordings, this includes a number of instrumental rehearsals and some rehearsals with Fergie Frederiksen. Those came about when they were considering adding a lead singer to let Cusano concentrate more on guitar and not have to worry about vocals. Shea and Waldo became founding members of Alcatrazz. Frederiksen later joined Toto. This definitely makes me think of what you might get if you crossed Kiss with Motley Crue and WASP. It starts with keys, but quickly powers out into the smoking hot metal sounds. There is more of a NWOBHM sound here combined with something closer to glam rock. Still, this is meaty and really drives. It's fiercer and meaner than the opener. I love the guitar soloing on this one. There are a lot of keyboards built into this. I wouldn't call the cut a ballad, but it's clearly not a rocker, either. I suppose it's a melodic rocker more than anything else. It has some great hooks and textures. This is more of an AOR rocker. It makes me think of something Rainbow might have done, but with more of a metal edge to it. We're back more into the metal zone on this stomper. It's another killer tune. Now, this number really feels so much like WASP meets Kiss that it's scary. This is one of my favorites here. I dig the AOR metal vibe on this cool cut. This is another high energy metallic instrumental piece. This instrumental take on the earlier cut is a rawer metal grind. Here is another killer instrumental take one of the songs from before. I think I like this better without the vocals. This is a screaming hot tune whether with or without vocals. I dig this rendition of the number. It definitely rocks. With a weird little run through before the cut starts, this is another solid rendition of the number from the main recordings. There is a big section of discussion and stuff at the end of this. Anyone who has ever been in a band will find that kind of rehearsal conversation and bits of music to be very familiar. They do a bit of a stripped down rehearsal on this at the start. There is some tuning going on from there. Then they launch into the actual song. The mix here is very bass heavy. I definitely prefer the other version. Part of that is the mix, but I think I prefer Cusano's vocals. Now, this cut is on fire. The recording leaves a lot to be desired, but the magic of the tune shows through anyway. With a bit of work-through at the start, this thing really fires out into a smoking hot metal number. It's one of the best cuts here, really.